Gone to America with a foreigner. I wonder about her as a foreigner in that country. There is even a statue to her in Yokohama where she boarded the ship to her new home, however, there's a secret and it's very similar to one we sometimes tell children about their beloved pet. 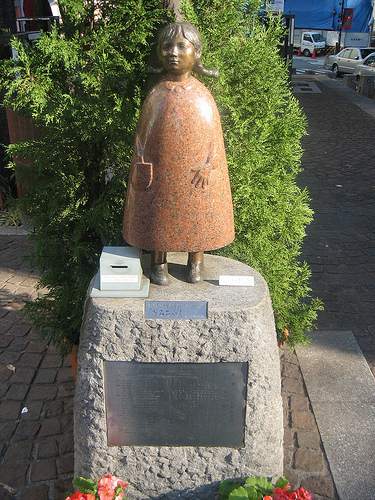 The give away is that there is also a statue in Azabu-Juban, a quiet, leafy, neighbourhood in downtown Tokyo. And the reason it's there is this is the site of the orphanage where she passed away from tuberculosis at the age of nine. Her mother, living in Hokkaido, never knew she didn't board the ship, and the father, sticking to his story all her life - "she's gone to a farm in the country".